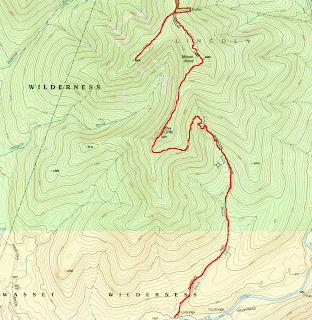 ELEVATION: 4265 Ft., 4698 Ft., 4540 Ft.
From 93 take Exit 32 and follow route 112 (Kancamagus Highway) for 5.1 miles. Cross the Pemigewasset River bridge and parking is at Lincoln Woods on your left. This is a large parking lot that will fill up quickly. The Lincoln Woods trail begins at the northeast side of the Lincoln Woods parking area and crosses the front porch of the ranger station then drops towards the Pemigewasset River. Cross the suspension bridge over and make a right turn following the Lincoln Woods trail. The trail parallels the East branch of the Pemigewasset river and follows a wide and almost level former railroad grade for 2.8 miles. The trail is wide enough for a truck to easily drive and still contains railroad trusses embedded into the trail running perpendicular to your travel causing an occasional trip hazard. The Lincoln Woods trail rises only 300 feet in it's 2.8 miles and other than an occasional trail junction is extremely uneventful. At 1.4 miles the Osseo Trail exits to the left and at 2.6 miles you reach the Black Pond trail junction. 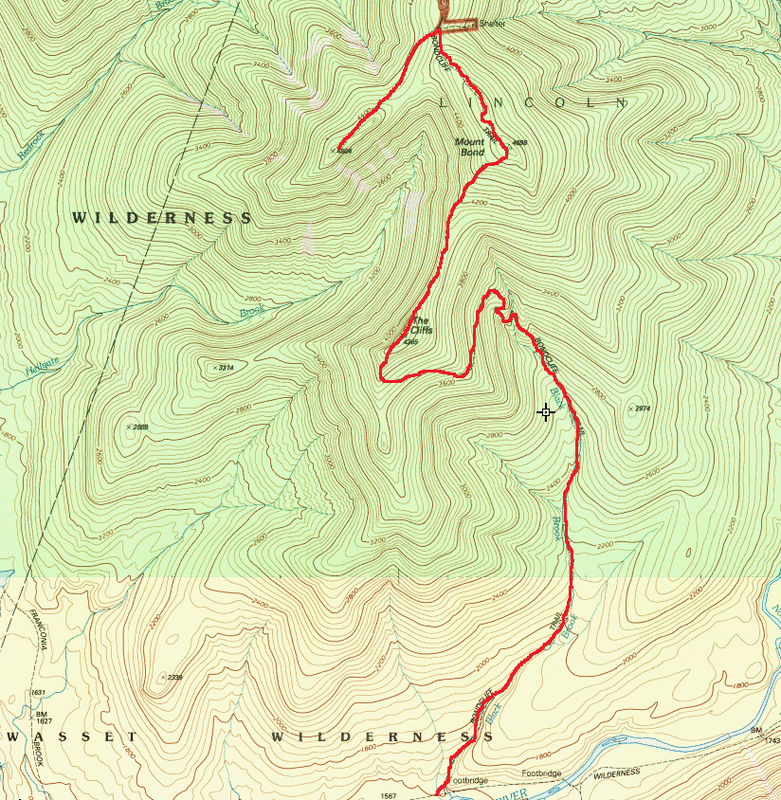 At 2.8 miles you cross Franconia Brook on a small suspension bridge and reach the Pemigewasset Wilderness boundary sign and the Franconia Brook trail branches to the left. Follow the Wilderness trail still paralleling the East Branch of the Pemigewasset River for another 2 miles. It crosses a small stream at 3.9 miles and reaches the Bondcliff trail junction after 4.7 miles and another 150 feet of elevation gain. The Bondcliff trail gradually ascends as it climbs an embankment to a former logging road following Black brook on your right. The trail crosses and re-crosses Black brook several times during ascent the first at approximately 1.5 miles, the 2nd at 1.9 miles and 3rd crossing at 2.5 miles. After the 3rd crossing the trail climbs a series of rocky steps, turns left and follows a logging road along a 3500 foot contour line a short distance before ascending a short steep scramble to the Bondcliff ridge. The trail ascend a ledge, breaks out of the scrub, and climbs the perimeter of Bondcliff to it's 4265 foot summit after 4.4 miles. This long section of trail is above tree line and exposed to the weather. It's views are unsurpassed in the White Mountains. The trail descends the ridge into a col then ascends steeply along the southern slopes of Mt. Bond. The trail enters the woods after 0.6 miles and reaches the 4698 foot summit of Mt. Bond after 1.2 miles. The Bond summit offers spectacular and commanding views of the surrounding area. Franconia Ridge can be seen to your east, Willey and Field to your West and the Presidential range can be seen in the distance. Continue north descending steeply 0.6 miles to the West Bond spur path. 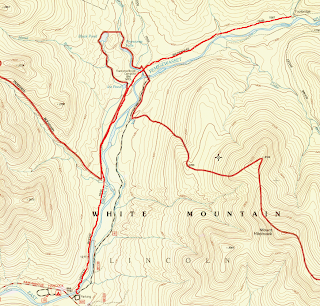 The short 0.5 mile West bond spur provides access to one of the most remote peaks in the White Mountains - West Bond. The West Bond Spur descends 0.25 miles then rises moderately before ascending a steep pitch to the 4540 foot West Bond summit 11.4 miles from your car. The summit is the most easterly peak of the West Bond ridgeline. To avoid confusion the USFS split the Wilderness trail into two sections, the Lincoln Woods trail being the first section and Wilderness trail the second section. The Lincoln Woods trail ends and Wilderness trail begins as it crosses the Pemigewasset Wilderness boundary line however it's the same trail and there is no junction or trail merge. Confused yet? Most hikers haven't adjusted to the change and still call the entire length the Wilderness Trail. 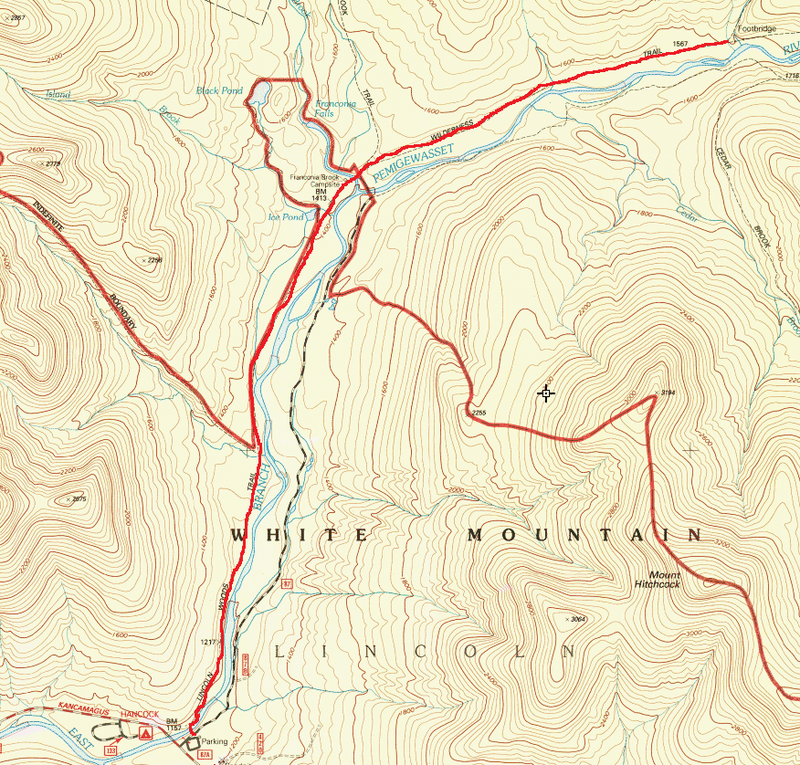 In this trip report I'm using the USFS designation of trail names in accordance with the AMC White Mountain Guide. Mt Bond and West Bond are the 14th and 16th highest peaks in New Hampshire while Bondcliff is the 30 tallest. 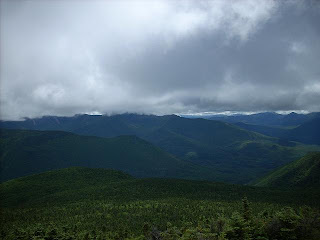 All three peaks are deep within the Pemigewasset Wilderness and require a long and arduous hike to earn their summits. All three peaks provide some of the most impressive views in all of the White Mountains with Mt. Bond offering spectacular panoramic views from the rocky summit. Clouds covering the peak of Mt. Bond.